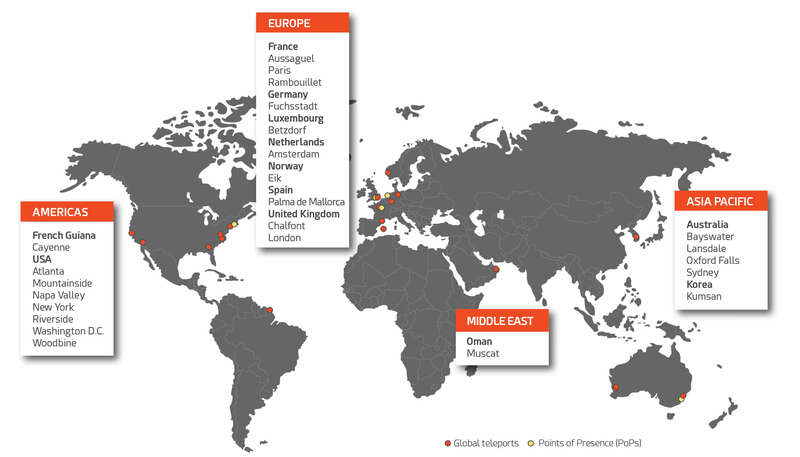 Through our world-class infrastructure, we deliver secure and resilient connectivity around the globe. Driven by customers’ needs, our network has been developed to offer more interconnections, platforms and communications solutions. With redundant, versatile and durable technology, we provide exceptional connectivity, even in the most inhospitable parts of the world. Global coverage, using Ku-, L-, C- and Ka-band. Multiple IP & networking possibilities to match customers’ varying needs for quality, flexibility, security and bandwidth. Teleport and terrestrial interconnect services, offering dual redundant communications paths. Alliances with the industry’s multiple global satellite network operators, offering a full range of fixed and mobile communications solutions: Intelsat, Inmarsat, Eutelsat, Iridium, SES, Thuraya, etc. Strategic alliances with terrestrial partners: In order to connect your global assets, we integrate terrestrial and satellite networks, making them work as one. Hybrid networks are secure and global, delivering seamless VSAT and terrestrial connectivity for secure corporate communications in 138 countries. The convenience of one-stop-shopping, delivering analysis of customer needs, network design, installation, maintenance, remote monitoring and after-sales support. 24/7 technical and customer service support. Operations support at all teleports.